We offer CNC Turning Machine Parts as per the customers’ demands to ensure their complete satisfaction. The CNC Turning Machine Job Work service is widely demanded for its superior quality and expertise, which our professionals have. We ensure timely execution and implementation of our CNC Turning Machine Job Work at reasonable prices. With our core values driven by a desire to achieve excellence and operate with the highest standards of integrity, we offer our clients with Turned Machining of Ferrous and Nonferrous Parts that are highly useful for electrical, electronics, automobiles and light. 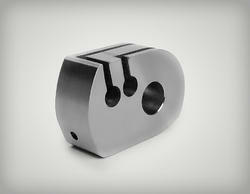 We offer wide range of Precision Milling Parts. Turned and milled parts are different components that are fitted to various machinery and equipment in industrial and mechanical sectors. We manufacture these parts using high grade raw materials like stainless steel, brass, copper, aluminum and many more as per the industrial standards and customer specifications. With latest manufacturing techniques and production methods our professionals make sure that these turned and milled parts offered by us are of high precision and quality, CNC techniques are also incorporated to maintain this. Our range of turned and milled parts includes various parts for automobile, hydraulics, pneumatic, etc. Well applicable to be fitted in various machineries the designs of these turned and milled parts. The manufacturing process and product tests are conducted under keen consideration of our professional’s thus flawless products is ensured. We manufacture and supply these turned and milled parts in different specifications, sizes and grades as per the requirements of our clients. Customers can avail these turned and milled parts from us in cost effective prices. Looking for CNC Turning Machine Parts ?